This is the one place where it's okay for us Engadget editors to be slightly behind the times. 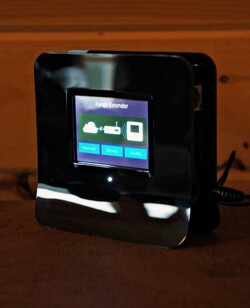 Back at CES a couple weeks ago, for instance, we got hands-on with the Securifi Almond+, a touchscreen router with a fancy all-white design and even fancier support for Zigbee / W-Wave home automation. Here in "IRL," though, we're just fine to talk about the OG Almond, which doesn't offer quite so many add-ons. Rounding things out, we've also got some anecdotes about the Galaxy Note II and Optimus G, neither of which need an introduction at this point. Look, I moonlight as the IT guy at the White House, okay? Now that we're having such an honest conversation, I will say that I've been on the hunt for an ideal WiFi range extender for some time now. Western Digital's My Net Wi-Fi Range Extender does a fine job, but a) it's pretty large and b) it lacks bells and whistles. If you're looking for an alternative that addresses both of those issues, let me introduce you to the other product I'd trust to stretch WiFi waves from the Situation Room to the Rose Garden: the Securifi Almond. While this is a bona fide WLAN access point / router at heart, I was focused primarily on testing its range extension abilities. I plugged the unit in some 90 feet away from a Netgear N900, watched the colorful touchscreen dance to life, and then tapped on a few screens in the Wizard Guide to set it all up. We've all heard it before -- "easy to set up!" -- but this one's truly capable of doing as advertised. Within four minutes, the unit had found my local 2.4GHz network, accepted my password and created a new network using that same password for areas that were previously out of reach. In practice, it adds another 150-odd feet of range to my N900, and I saw no degradation in performance while streaming video. The touchscreen also continues to be useful after you've pecked in your information. You can have it display the local weather or the time, making it a pretty awesome glanceable piece of technology while it's broadcasting in the background. Two quirks, though: one, the weather forecast (apparently) doesn't update on its own, and two, the clock reversed AM and PM in my testing. Granted, both of these are in "Beta," and I'm hoping the company adds even more functionality through OTA software updates -- which the unit is fully capable of receiving. The other bits you should know about: it won't rebroadcast 5GHz signals (boo! ), and it actually creates a new SSID (network name) instead of just amplifying your existing one. This means that once you walk out of range of your existing router, you need to disconnect and reconnect to a new network name, which is a slight hassle. Those things aside, it's a solid performer at $80, and hopefully it'll get even better once the updates begin to roll in. 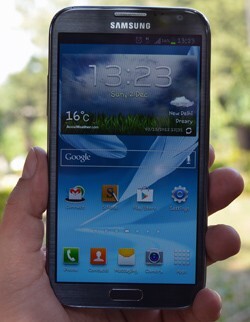 I was among the naysayers when Samsung released the Galaxy Note. Maybe it was my memories of the Streak 5 or perhaps it was just dread at the idea of carrying around a gargantuan handset. The Note's massive success did little to change my perception, but it did make me look at its successor with respect. Spec bump aside, the Galaxy Note II is certainly a more mature product compared to the OG Note, what with its bag of software tricks and that improved S Pen. I can see the S Pen's usefulness for not only the creative types, but also obsessive note takers and for general tomfoolery. Add smooth performance and impressive battery life, and it makes the Note II quite a compelling proposition indeed. Attempting to occupy that middle ground between smartphone and tablet, the Note II's size is its chief strength as well as its weakness, depending on how you look at it. Despite the new one-handed mode that shrinks the keyboard and dialing pad and docks them to the side, I still think the large size is tough to handle with a single hand. Heck, even using the lockscreen slider to accept or reject calls might be an issue if you try doing it one-handed, making the pebble-smooth handset prone to slipping. Ditto when you stretch your thumb across the glass to pull down the notification bar or to reach any app controls placed on the top. On the flip side, watching movies is lots of fun thanks to that big display, as is playing games. Apps like Flipboard also shine with some extra screen real estate. Features such as multi-window and pop-up video make great use of the extra screen real estate and add to the device's pull factor, much more than having the same functionality on its smaller sibling, the Galaxy S III. Basically, when it comes to smartphones, size does matter. It's really up to you what you prefer -- a large slab that can possibly help avoid the hassle of lugging both a phone and a tablet, or a conventional-sized blower that's more pocket-friendly but leaves something to be desired when it comes to the media and app experience. Personally, I think of these high-end phablets as SUVs of the smartphone world -- hardly easy to parallel park or squeeze into tight spaces -- but big, powerful and spacious. Love 'em or leave 'em, they're here to stay. 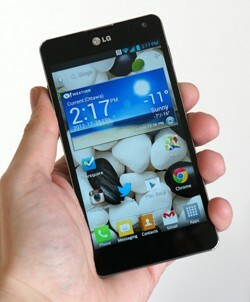 The Optimus G feels like the Nexus 4's neglected cousin. Both LG phones are capable, but the Nexus 4's status as the official Google phone -- and the accompanying $350 unlocked price -- tend to overshadow the Optimus G's more traditional approach. I felt compelled to try the Optimus G on Rogers for a few weeks for just that reason. Is it worth it to give up stock Android and pay more, all so that you can score a few hardware advantages? The Cliff's Notes answer: yes. In some cases, anyway. The battery life could certainly clinch a few sales. Where the Nexus 4's runtime is fairly average, the Optimus G has no problem lasting through a photo- and Twitter-heavy day. The 32GB of storage space is naturally useful for a hefty music collection like mine, too. LTE is indeed appreciated versus the Nexus 4's dual-carrier HSPA+ 3G, although I'll readily acknowledge that the 3G in my area is often fast enough. I'm even sanguine about the interface, despite my preference for pure Android. LG's custom interface feels relatively unintrusive and light, at least next to Samsung's TouchWiz. It mostly stays out of the way, and it doesn't lean on gestures that might only be useful once in a blue moon (see: Samsung's tilt-to-zoom). If an unfettered Google experience isn't a factor, about the only potential dealbreaker is that oh-so-frustrating camera focus system. The Optimus G's camera (eight megapixels on the Rogers model) is fine in much of the time, but it's tough to compose some macro or close-up portrait shots when the continuous autofocusing offers just a split second of sharpness before it readjusts; I've taken a few photos that looked fine in the preview but were blurred by the time I hit the capture button. If LG ever embraces traditional autofocus for the Optimus G's camera, though, it'll be easier to recommend it, regardless of whether the Nexus 4 is on the shopping list.